Corio Shire (1864-1993), an area of 745 sq km, extended from Church Street, Hamlyn Heights (Geelong) to Little River, north of Anakie. Its northern and eastern borders followed the river to its mouth on Port Phillip Bay, west of the Werribee sewage-treatment plant. Its western boundary was (in part) the Moorabool River. Quite early there were rural villages. Fyansford, on a fording place on the Moorabool River, West Geelong, began with an inn in 1843. Little River's Travellers Rest Inn opened in 1841 and Batesford's Moorabool Inn in 1843. Lara, on a creek like the others, was otherwise an exception. Lara village came about from the building of the railway line from Melbourne to Geelong in 1857, and the shire was headquartered there from 1864 until 1938, when it moved to Osborne House. Lara, on Hovell Creek, was about in the middle of the shire. With the exception of the suburb of Corio, the other postwar suburbs were settled by significant numbers of central and southern European migrants. Socio-economically they were working class, but with reasonably secure employment so long as manufacturing industry continued. The former Corio Shire contributed nearly a third of the population of Greater Geelong when the amalgamated municipality was created in 1994. 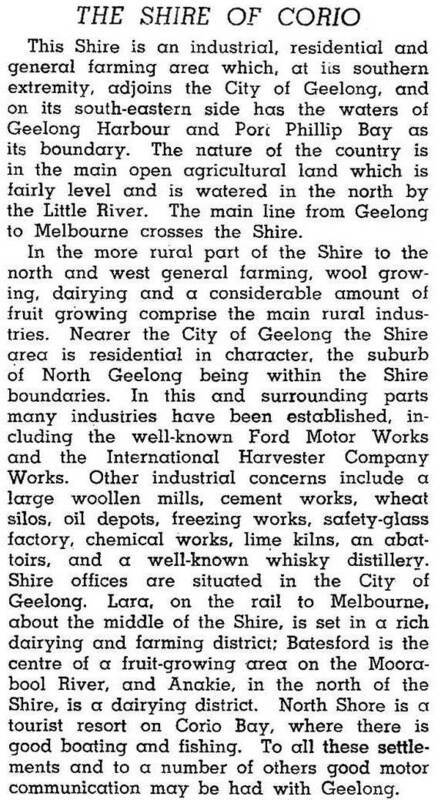 On 18 May 1993 Corio Shire was united with Geelong, Geelong West and Newtown cities, Bellarine and South Barwon Shires, and parts of Bannockburn and Barrabool Shires to form Greater Geelong City. * Urban components were 25,712 and 53,340.